2 Story seasonal rental home in Cinnamon Beach. Ocean and lake view seasonal rental. Total custom new home construction is where Stull Construction can really shine. We have many years of experience to make the process smooth and efficient. We prefer being involved in a project from listening to your ideas and concepts and helping you to organize them into everything you want in your Dream Home. We want to be YOUR new home builder! 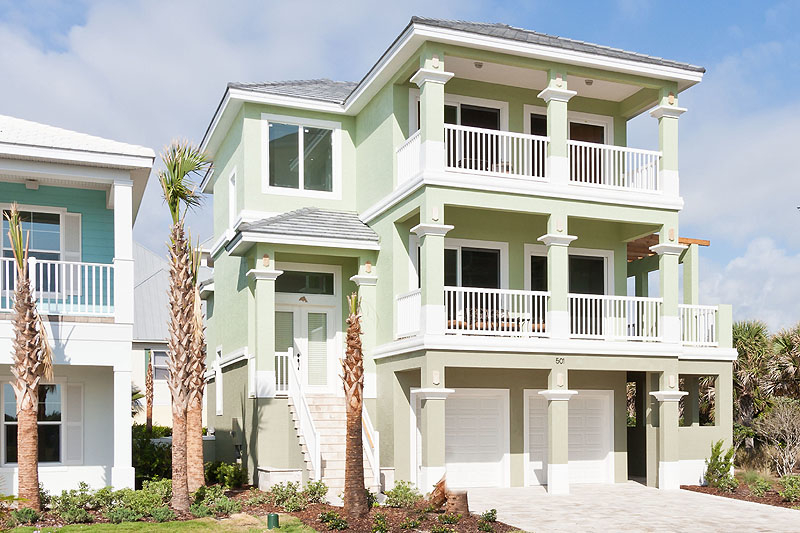 From historic New Smyrna Beach to prestigious Ocean Hammock, we are well versed in the specific obstacles that coastal construction presents to the construction process and future life of the home. Using some of our recommended ideas on coastal home construction can save hundreds of thousands of dollars in maintenance and repair over the years. Michael Stull is a NAHB certified green professional. There are times when green technologies make financial sense and sometimes they don’t. While putting in geothermal air conditioning systems are extremely efficient, the high cost of the systems do not always warrant the expense. A few of the other Green Systems we do recommend and have a very nice return on investment are closed cell spray foam insulation, super energy efficient windows and doors, low flow toilets and fixtures and LED lighting systems just to name a few. Regardless of where you want to build – in Ocean Hammock, New Smyrna Beach, Cinnamon Beach, inland or beach side, in Volusia, Flagler or antoher nearby County, contact Stull Construction, Inc. There are many other builders to choose from, let us prove to you why we are the best choice for your new home construction.